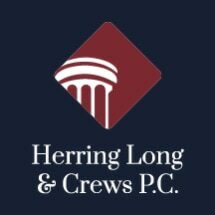 MoreHerring, Long & Crews, P.C. is a civil practice law firm with headquarters in the historic downtown business district of Canton, Mississippi. The original firm was founded in 1950 by Judge G.B. Herring, deceased, and has operated continuously since that time.Based in Madison County, near the geographic center of the state, our practice extends primarily from the Gulf Coast to the Tennessee state line and is essentially a statewide law practice, although opportunities occasionally present...Herring, Long & Crews, P.C. is a civil practice law firm with headquarters in the historic downtown business district of Canton, Mississippi. The original firm was founded in 1950 by Judge G.B. Herring, deceased, and has operated continuously since that time. Based in Madison County, near the geographic center of the state, our practice extends primarily from the Gulf Coast to the Tennessee state line and is essentially a statewide law practice, although opportunities occasionally present themselves for handling or advising on legal matters occurring outside Mississippi, particularly in the public utility field. Our attorneys have practiced together for over twenty years and have nearly one hundred years of combined legal experience among them. Our long and stable record of excellent legal representation ensures that we are able to meet our clients’ needs and expectations in a broad range of legal services. Mr. Herring and Mr. Crews have established a legitimate and known speciality in legal matters involving public utilities. Mr. Herring is attorney for the Mississippi Rural Water Association, Inc., and numerous public utilities which bring him in contact with similar organizations, nationwide. Mr. Long has established an extensive real estate and collections practice and has significant expertise in obth fields. Both Mr. Long and Mr. Crews do a significant amount of work in the domestic relations field.